1937 to 43 Marion Biles (nee Johns) remembers that at school there were small camp style beds for the infants to rest on during the day - pink blankets for girls and blue for boys. On a Friday afternoon Miss Lunn used to take the children to the top of Windsbatch for storytelling and fairy cakes. 1938 - 7 March. Nurse Allgood paid her first visit to the school. Soon after the outbreak of war evacuees began arriving in the village. They came in groups from London by train at all times of the day and night and were found homes around the village by billeting officers. Brian Marsh was one of the local Scouts who were assigned the task of escorting the evacuees to their host families. A payment of 8 shillings and 6 pence per evacuee was made to the head of the household to cover costs, camp beds and blankets were provided free. Two or three adults had accompanied them. Miss Howard was in charge and lodged with Miss Luckham on the corner of Jesty's Avenue and Littlemoor Rd. By January 1940 over 800 child ren had arrived in Weymouth. 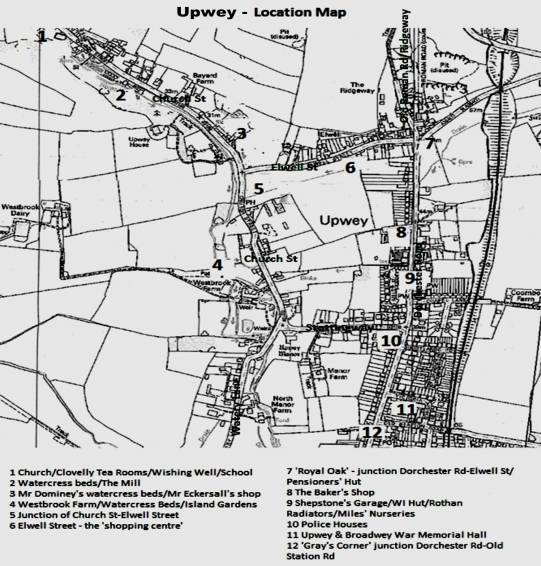 At Upwey, to begin with the school was not big enough to accommodate the village children and evacuees, so to the dismay of some of the children, a system was developed whereby all the children received some schooling. The village children attended school in the mornings and the evacuees in the afternoons. The evacuees spent the mornings reading, playing games and singing in the Reading Room at the bottom of Elwell Street. At lunchtime the children swapped venues. The WI Hut and Reynolds Institute also played their part. 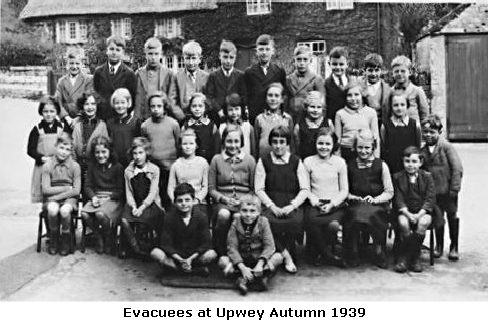 Later the evacuees from Upwey and Broadwey attended class in the Temperance Hall on Broadwey Hill. ARP trenches were dug in the grounds of the Rectory - on 26 September 1939 a practice signal was sounded - it took 3 minutes to get the children to the trenches. Gas masks were issued to the children by Captain Menzies and Mr Cooke. 1939 - 27 November. Upwey and Southfield School children were full time in the school building. Southfield Infants (17 pupils and 2 teachers) shared the Infant Room with Miss Lunn. Southfield Junior (30 pupils) were in the Junior Room with 2 teachers and Upwey's Standards 1 to 6 were in the main room. 1940 - 2 May. Trench practice took 2 minutes. 1940 - 31 May. School closed as teachers were arranging for the billeting of French Soldiers. 1940 - 11 June. All teachers to be at their schools by 5am to await soldiers or refugees - nobody arrived. The Rector authorised teachers off duty at 4pm. School closed until 17 June. 1940 - 1 July. Southfield class disbanded the 13 children absorbed into Upwey School. 1940 - 4 July. Air raid - 37 children to trenches at 8.55am - All Clear sounded at 11.25am. There were regular air raids from July to December. 1940 - 14 October. School closed until today owing to damage from air attack. Smalls groups were taught by Miss Lunn in rooms lent by Mrs Hansford of Elwell Street and Mrs Johns of 823 Dorchester Rd. Classes 1 and 2 were at the school, where they were split into am or pm for greater safety. All back at school 13 December 1940. 1941 - 7 February. Firewatchers at school included Messrs Tewkesbury, Dunham, Ford, Carter, Wellen, Cooke, Carpenter, Beck and Clarke. 1941 - 21 March. An Air Raid Shelter was constructed in the school grounds and blackout curtains hung in the school - completed 26 Sept. There were regular air raids from April to September. 1941 - 30 May. 176 oranges supplied by Drakes of Weymouth to be sold at 2 for 21/2d. 31 children received prizes of Savings Stamps for essays and posters during War Weapons Week . 1941 - 16 September. 23 children from Class 1 went on a blackberry picking excursion -22lbs were picked and sold to the Jam Making Centre in Weymouth raising 5/6 for school funds. During September a further 73lbs of blackberries were picked for Miss Bown of the WI. Jam was made at the WI Preserving Centre in outbuildings at Dawlish House. 1941 - December. The children were taken to see films at Alexandra Gardens Theatre. 1942 - regular air raids - gas masks regularly checked. 1942 - 29 April. Soldiers sleeping in the Infants Room. 1942 - 21 May. A visit to the Travelling War Savings Cinema. 1942 - 25 November. Jack Burden gave a talk to the children about his journeys in Egypt and his work re-fitting aircraft there. 1943 - Regular air raids. 1943 - 3 September. National Day of Prayer with radio service held in the school attended by the rector, pupils and 17 workers from Upwey Manor. 1943 - September. Pupils collected 131 lbs of blackberries. 1944 - 2 May. 832 books collected by children for the second Book Collection for Troops. 1944 - 10 May. School closed due to 6-a-side football tournament in Weymouth as part of 'Salute a Soldier' Week. 1944 - 29 May. 5 children aged 12 were absent from school - helping Mr Pashen lift potatoes. 1944 - 5 October. Safety wire removed from the windows. 1945 - Mark Russell visited the school in April 1945 and Percy Cornick in June 1945. The children had been regularly sending them books, games and cigarettes whilst they were detained as Prisoners of War. 1944 - 20 Nov. Senior pupils visited the American Exhibition at St Nicholas School, Broadwey. 1945 - 21 September. 32lbs of rose hips collected. 1946 - 2 July. A visit to the Regent Cinema as a Victory Treat. 1946 - 23 July. Children taken in a special charabanc to the Sidney Hall to see the West Country Children's Theatre. 1946 - 9 September. 1/3pt bottles of milk now supplied free to all children who want it at morning playtime. 1947 - 30 January. Heavy snow and cold wind - only 11 out of 39 present. 1947 - February to June. Various parcels arrived from Upwey High School, Australia. Contents included jellies; dried fruit; tinned meats; and dripping. Family names drawn out of a hat was seen as the fairest way of deciding who received the parcels. 1947 - 17 June. 12 senior pupils visited Weymouth Lifeboat. 1947 - 20 November. School closed for the Wedding of Princess Elizabeth. 1948 - 5 to 15 February. School closed for demolition of air raid shelters. 1948 - 26 April. School closed in the afternoon, for Royal Silver Wedding Holiday at the request of the King. 1948 - 27 May. 20 pupils go to Folk Dancing at Bovington. Pupils at Upwey until 14 years old. 1949 - 1 April. The 7 eldest scholars officially became pupils of the new Broadwey Secondary Modern School, although remaining at Upwey until the end of term. They were visited by the headmaster Mr P Jeavons. 1949 - 8 April. Mrs Dowden left after 20 years. 1949 - 2 May. Miss I Rogers was acting Head teacher. 1949 - 21 June. 40 children and 2 teachers went to Weymouth for the visit of Princess Elizabeth and the Duke of Edinburgh. 1950 - 4 September. 51 pupils. Mrs Hannam, acting Head teacher, who would dry the children's wet clothes on the boiler. 1951 - 30 November. Erected a stage in the main room. This had been found over the girls' toilets and apparently had not been used for more than 20 years. 1951 - 21 December. Pupils gave a concert to parents - Standards 1 and 2 Rumplestiltskin - Standards 3 and 4 Scrooge - Infants Recitations and Percussion Band. 1952 - 15 February. Pupils listened to a relay of the BBC radio funeral of King George VI and observed 2 minutes silence. 1952 - 13 March. Confirmation at the Church attended by the Bishop of Sherborne. Terry Wright was at the school from 1952-9. He remembers there were 3 class rooms, each with a Tortoise Stove but it was still very cold. 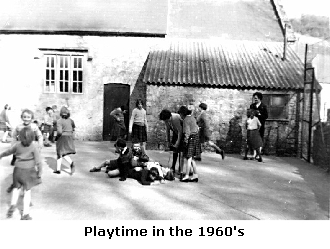 There were about 15-20 children in each class, and bottles of milk at playtime. Dinners came from Broadwey Secondary Modern School in aluminium containers; we sat at the desks to eat the food. There were 2 or 3 dinner ladies. In the junior room there was a glass cabinet on the wall with a snake in a jar eating a mouse. Mr Stokes was very strict. We played skipping and ball in the playground. The lane outside was sometimes covered in cow's mess from them making their way up Windsbatch. We used an abacus to count - days before calculators! We made things with clay and raffia. 1953 - 22 May. Councillor Mrs F Kenyon presented souvenir Coronation Mugs and sweets to the children on behalf of Weymouth Corporation. 1953 - 2 June. School took part in Coronation Celebrations at Westbrook. Entrants in the fancy dress competition marched in procession through the village to Westbrook where a service was led by Rev Bryant, Rector of Upwey and Rev J Bennett Minister of Upwey Congregational Church. 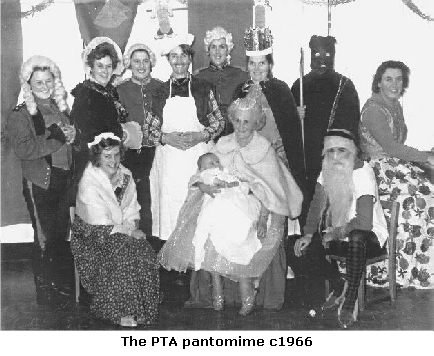 Sports, Punch & Judy, sideshows, a display of children's country dancing and a bumper tea for the children were followed by the presentation of souvenir coronation mugs. 1953 - 19 June. Whole school taken to the Odean to see 'A Queen is Crowned'. Scholarship Exams and Grammar Entrance Exams. 1955 - 10 June. Annual school excursion to London cancelled due to the railway strike. 1955 - 1 July. Letters sent to parents of children who catch the bus at the top of Stottingway asking for their co-operation in controlling the bus queue. 1955 - 18 July. Heavy rain during the evening and night caused serious flooding and damage. The flood water reached a height of 1'4" in all classrooms and 3'1" in the new west cloakroom. Mrs Hannam, Mrs Pride, Mrs Hutchings and Mr Stokes worked all day shovelling mud out, swilling and rescuing books and apparatus. The work continued for the remainder of the week - the school being closed. Much stock was ruined and rendered useless. 1955 - 7 September. 70 on role - BBC schools programmes on radio. 1955 - 18 November. School photos taken. 1956 - 1 June. 31 children performed Folk Dances at Westbrook fete. 1956 - 15 June. At a Managers' Meeting school visits to London and Bovington, purchase of a new wireless and provision of a cycle shed were agreed. Also discussed was the acquisition of a small piece of land above the yard for use as a school garden. 1956 - 27 June. 31 children attended Folk Dancing at Bovington. 1956 - 29 June. 24 children enjoyed a trip to London and the Zoo. They went by train from Upwey Junction at 8.56am, returning at 10.30pm. 1956 - 10 September. 79 on roll. 1956 - 12 October. On Monday the water main near Eckersall's shop burst preventing traffic using the road. Dr Ward with her car helped carry school dinners and on Tuesday the Head and older children carried the containers. All normal by Wednesday. 1956 - 26 October. School photos taken. 1957 - 31 May. 24 children went on an excursion to the Isle of Wight. 1957 - 28 June. 28 children went to Folk Dance Festival. 1957 - 31 July. Mrs Pride left the school. 1957 - 13 September. 79 on roll. 1957 - October 1957. Asian Flu - low attendance. 1957 - 19 December. Christmas Party included 11/2hrs film shows and tea. 1958 - February. Cows using the lane to Windsbatch are making conditions unsuitable for pedestrians - resolved that the cows would no longer use the lane. 1958 - 16 May. Reporter and photographer from the Southern Times visited the school for information re article 'Upwey Village'. 1958 - 6 June. School photos. 1958 - 4 July. 29 children on excursion to London. 1958 - 12 September. 73 on roll. RSPCA gave talks about caring for pets. 1959 - 1 May. 50 children taken to Weymouth to see the Queen's visit to HMS Eagle. Prince Charles accompanied her. 1959 - 26 June. Outing to Wookey Hole, Wells, Bristol Zoo and Bath. 1959 - July. Bovington Folk Dancing Festival. 1959 - 23 July. Mrs Dowding left. 1959 or 1960 - December. Carol Petty remembers playing the part of Mary at the Nativity and singing a solo 'The Magnificat', with just the first note set up for her. 'When I saw tearful people, I thought I'd done something wrong and they were sad. Quite the reverse apparently.' Carol also remembers that in the summer they were allowed, in pairs, to go into the Wishing Well café across the lane to buy a threepenny ice-cream or a tuppenny lolly. 1960 - 6 May. School closed for Princess Margaret's Wedding. 1960 - 3 June. 24 children went on excursion to Windsor and London Airport. 1960 - 17 Jun. 17 children having swimming lessons at Broadwey Secondary Modern School. 1960 - 1 July. Bovington Folk Dancing Festival. 1960 - July. Measles epidemic. 1960 - 16 September. 67 on roll. 1960 - 28 October. Parish social held at the Memorial Hall - children performed songs and dances. 1960 - 16 December. Christmas Party at the Memorial Hall. 1960 - 20 December. Nativity at the church. 1961 - 28 March. Mrs Hannam left. 1961 - 28 April. 15 parents attended a lecture by the WVS about Nuclear Attack. 1961 - 13 June. 24 children went on outing to London Zoo. 1961 - 22 September. 64 on roll. 1961 - 15 December. Christmas Party at Memorial Hall. 1962 - 2 February. School photos taken. 1962 - 22 June. Swimming lessons at Broadwey Secondary Modern School. 1962 - 14 September. 58 on roll. 1962 - 2 November. First PTA meeting held. Other teachers at the school in the 1960's included Mr Brownie, Mr Dean, Mr Longbotham, Mrs Greenslade and Mrs Beeson. 1960's - A very important job was the 'milk monitor' who put the straws in the tops of the small bottles of milk or orange, ready for pupils to drink at playtime. Afterwards the monitor would collect all the bottles, rinse them and put them back in the wire crates; having carefully removed the silver foil tops as these were saved to go towards guide dogs for the blind. In really cold weather the milk would be put on top of the room heater to warm up! Mr Russell delivered school dinners in a dark green Dormobile type van, the dinners having been cooked at Broadwey Secondary Modern School. The school dentist visited in a large van equipped as a dental surgery to check on pupils' teeth. Hearing tests were also carried out, and the 'nit-nurse' made regular visits. Dorset Schools' country dancing festivals were held annually at Bovington or Holy Trinity. To encourage children to save you could buy National Savings Stamps at school as well as at the post office. 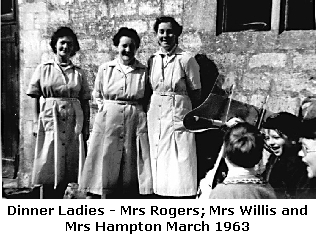 1964 Nurse Allgood retired, she had been a regular visitor to the school since March 1938, checking on the children's health. 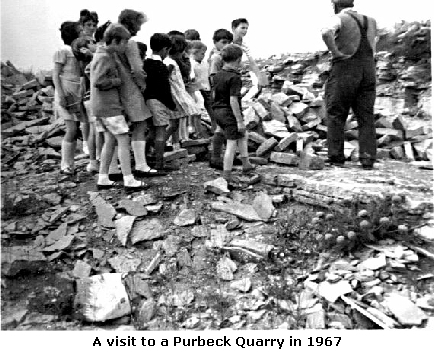 1964 - 9 Sept. Mr Brownie head teacher, Mrs Beeson started - 51 children on roll. 1964 -17 Sept. The boys played today on their new football field ' The Plot', located via footpath between Church Street and Prospect Place. 1965 - July. The annual sports day was held at the Radipole School sports field. All the races were keenly contested and enjoyed by the many parents who attended. Mr F Virgin, one of the school managers, donated and presented two cups. 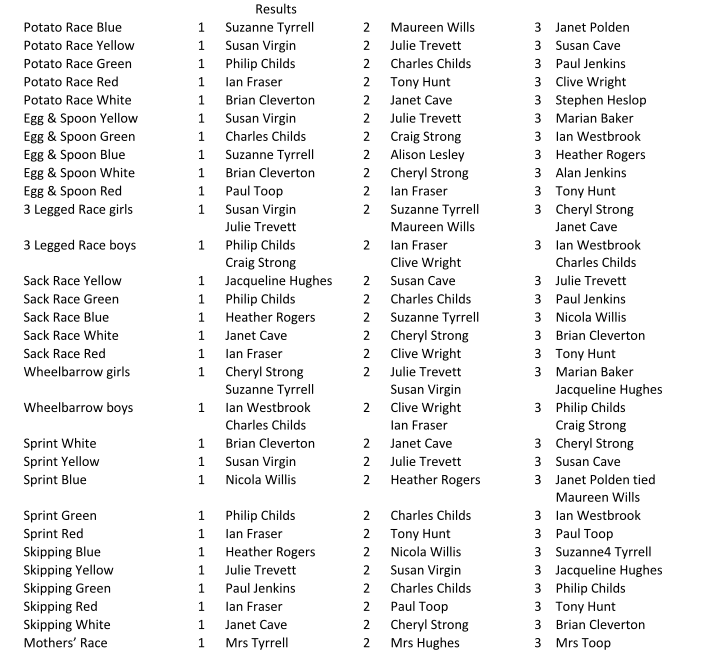 These were won by champion boy Ian Fraser (Red House) and champion girl Susan Virgin (Yellow House). Refreshments were provided by the Parent Teachers Association. 1965 - 6 Oct. Harvest Festival Service in the school. An impressive amount of produce brought to school was later taken to Cheshire Home in Dorchester. In the afternoon the children were taken to the service of consecration for the new burial ground attended by the Bishop of Salisbury. 1966 - 6 May. Fete held in school raised £21 for starving children in India. Children in charge of various stalls were: Produce - Susan Virgin; Comics and Books - Tony Hunt and Craig Strong; Toys - Marian Baker and Robert Hustler; White Elephant - Alison Lesley and Janet Cave; Plants and Flowers - Charles Childs; Fruit and Vegetables - Jacqueline Hughes and Philip Childs; Guess weight of the cake - Susan Cave; Competition for basket of fruit - Julie Trevett; Hoopla - Ian Westbrook; Skittles - Clive Wright. 1966 - 9 June. Mrs Wells, caretaker, resigned as she was leaving the district. Mrs Hughes appointed. 1966 - 25 Oct. Juniors taken to see 'Greatest Story Ever Told' at the Gaumont cinema. 1967 - 10 Jan. Mr Brownie returns as relief Head. Mr Dean had been temporary head since May 1966 and went back to Westhaven School, Miss Y le Boutillier also left having taken full time position at Broadwey Secondary Modern School. 1967 - 21 June. Juniors attended the South Dorset Folk Dancing Festival at Holy Trinity - the girls wore skirts made and presented by the PTA. 1967 - 27 June. School Outing to Longleat House. 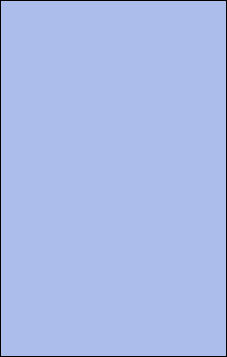 1968 - 11 Mar. Juniors visit Mr Childs' milking parlour and Lovell's Creamery as part of their Milk Project. 1968 - 24 May. Mr Butler gave permission to use the paddock at the back of the school for a play area. 1968 - 1 September. Although we lived near the sea very few children left the school able to swim; so concerned were parents that a meeting, held in September 1968, voted in favour of raising funds so that the village children have their own learner swimming pool by 1969. During the summer holidays coffee mornings were arranged, fetes and a baby-sitting service started. 1969 - 30 January. David, Julie and Ellen Adams presented with Oxford dictionaries when they left the school to emigrate with their family to Australia. 1969 - 3 June. New field and swimming pool used today for the first time - pool officially opened by Mrs Gascoyne Williams. Mrs Cary and Mrs Childs of the Red Cross gave demonstration of the 'kiss of life'. 1969 - 23 July. Mrs Kenyon presented dictionaries to leavers and presented 20 swimming certificates to those who had learnt to swim this year. Agreed that the pool could be used weekday afternoons in the holidays. 1969 - 13 Oct. Mrs Kestin started mornings only. She remembers it being a delightful school with lovely children. The boys played football on a sloping field - one boy had to stay by the road to stop the ball going in the road. Rev Jones visited on Wednesday mornings holding a service for the whole school in the main hall, followed by bible stories- the children loved him. 1970 - 6 Mar. The Head gave a talk to PTA about decimal currency. 1970 - 21 April. Mrs Tyrrell Treasurer of PTA. 1970 - 18 June. Visit to the new Thorncombe Wood Nature Trail. 1970 - 17 Dec. Mr Brownie left and on 6 Jan 1971 Mr Roche appointed Head teacher. 1971 - 26 Feb. Two beer casks were purchased form Devenish and cut in half for flower tubs outside the school to improve the appearance and give interest to children - earth to fill came from the local farm. 1971 - 9 June. Victor Milligan and Janet Woodward represented the school at the Weymouth Yacht Club to see HRH Princess Anne - largely a non-event owing to HRH not arriving. However the children had a good tea! 1971 - 18 Oct. The Head's Birthday coincided with an infant - so the infants' sang Happy Birthday to us both - bless them! Child received 7 claps and the Head 21 !! 1972 - 12 Jan. Mrs Osmond, dining room assistant left. She suggested the money collected for her by the children should be used to buy some games for their use on 'wet day' play times. 1972 April. Bill White appointed Head teacher. 'Quickly felt settled and happy owing to the fact that everyone contributes to a very pleasant atmosphere.' He remembers that outdoor pottery developed when Phil and Maggie Cook arrived. The Church was often used as a hall for arts, craft, drama and music. 1972 - 23 June. Alisdair and James Robinson, Mark Honebon and Peter Tyrrell competed in Dorset Swimming Championships at Bovington. 1973 - 28 Sept. Notice of closure published. 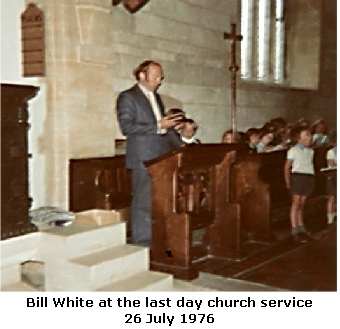 News came that Upwey School would close in July 1976. Falling numbers at the school made this inevitable and the 39 Upwey children joined with Broadwey pupils at St Nicholas & St Laurence School, next to Broadwey Secondary Modern School at Nottington Corner, in September 1976. 1973 - 14 Dec. Mary & Joseph p aper sculpture in the Church, Christmas traditions performed. 1976 - 25 June. Infants' outing to the Lasseter's Farm (sheep) at Corton. 1976 - 23 July. Last week of life of the school. Tuesday potted sports got us in the party mood. Thursday visit by Westward TV. 'There was of course an air of sadness at the end of term service, mixed with a feeling of pride in the past. The children sang and read well. So ends an era for Upwey, the end of the village school, but the memories of its activities will live on as will the personalities of the children who will contribute strongly at their new school in Broadwey and who look forward confidently to enjoying their new facilities. Return to School Memories 1/2…..